Wednesday, September 12, 2012. I had never eaten at a food truck before. My curiosity was first piqued by buzz in the “food blogger” world concerning an escalating tension between food trucks and some of the brick-and-mortar restaurants in Boston. The dispute was playing out not just in our city but across the country: Do food trucks have an unfair advantage over brick-and-mortar restaurants? And if so, then should it be up to city governments to level the playing field by placing restrictions on food-truck operations? 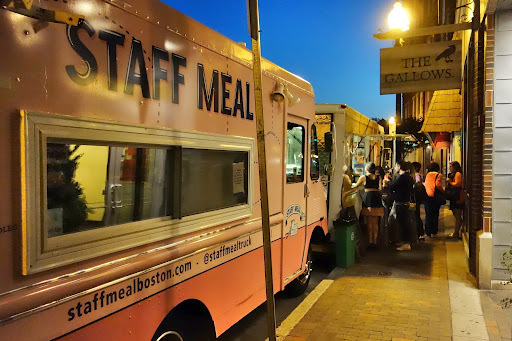 When I saw on Twitter that the Gallows would be hosting a “food truck dinner” with the Mei Mei Street Kitchen and Staff Meal food trucks, I laughed aloud. All three of these eateries had been near the top of my wishlist for some time, and now it just happens they’re hosting a dinner where I can try food from all three. Perfect! The Gallows joined my Must-Try list on to the strong recommendation of a longtime friend—who, unrelatedly, has excellent taste in hats. I had known this friend for five years and yet only recently learned that he is a discerning foodie with many, many restaurant recommendations hidden up the sleeve of his trademark black coat. His parents told me that one of their favorite employees at one of their favorite restaurants had moved to work at the Gallows, and that they liked this employee so much that they “followed” him. Result? The Gallows is now one of the family’s favorite restaurants in the city. Staff Meal came across my radar by virtue of its publicized conflict with the Phantom Gourmet brothers. The Phantom Gourmet brothers are diehard supporters of city-imposed time-and-place restrictions on food trucks, specifically that all food trucks be required to stay 1,000 feet away from brick-and-mortar restaurants, while Staff Meal is one of the most vocal advocates in the city for the side of the food trucks. As a result of reading about all this I began paying attention to food trucks, and added Staff Meal to my list after seeing the strong support it attracted from Boston diners of every variety. Mei Mei (pronounced “may may”) is the most recent addition of the three to my list, since they won Boston Magazine’s prestigious “Best of Boston” award in the “Meal on Wheels” category. I was initially pretty miffed that Best of Boston neglected to include an award for food trucks, until I realized that there was a “Meal on Wheels” category tucked into the “Oddball” section of the awards rather than with the “Food and Dining” section. I maintain that a food-truck award belongs in the same category as other food awards, and that belief was reinforced by this dinner. The Gallows, Mei Mei, and Staff Meal pop-up dinner! Our reservation was for a time slot from 8–9:30pm. My boyfriend and I arrived a good half-hour early to find the Staff Meal and Mei Mei food trucks both parked at the curb right in front of the Gallows. We chatted a bit with the Mei Mei owners who were friendly and funny, and who told us how much planning had gone into this dinner. 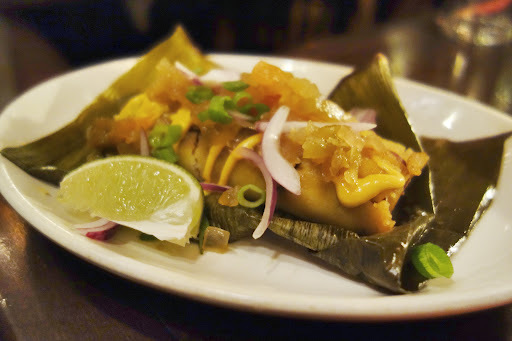 Apparently the Mei Mei and Gallows owners met and discovered they had been grade-school classmates, and coincidence turned into serendipity shortly thereafter when one of them had a late-night flash: A collaborative pop-up dinner! My dining experience began, as always, by poring over the menu. It was divided into three main sections: small (appetizer), medium (entree), and large (shared among two or three people, or alternately, hoarded by one Nicole’s Boyfriend). Each section featured dishes from each of the three contributing eateries, so there was even representation all around. I had a difficult time deciding what to order. I’m naturally indecisive when it comes to ordering at restaurants, but it is worse (read: frustrating to my dining partners) when it’s a special dinner and thus a one-time menu. No chance for, “I’ll order the beef tonight and if I like it, then I can come back next week and try the chicken.” I only have ONE SHOT to make the best of this menu. And this occasion made for a particularly difficult decision because so many items jumped off the menu at me. Mei Mei’s traditional pork dumplings with soy vinegar and chili aoili. The Gallows’ “pickle plate” consisting of eggplant with honey and mint, curried peaches, vinegar peppers (my favorite!! ), goat feta, and grilled flatbread. Staff Meal’s “pig trotter” katsu sando with fried pig’s foot patty, tonkatsu sauce, mayo, and pickled cabbage. I can’t even write this paragraph without thinking that stuffed as I was by the end of the meal, I should have ordered these other items anyway even if I just could only manage a bite of each. But ultimately, somehow I did manage to decide. 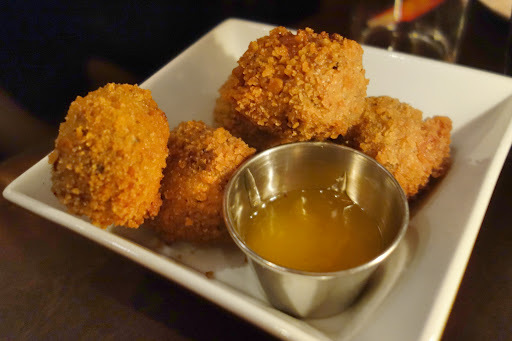 For my appetizer, I went with Staff Meal’s “lap cheong arancini” ($12): Chinese sausage + fried rice balls, with duck sauce. The sausage was flavorful, the fried rice top-notch, and the duck sauce added some sweetness. I loved it! I haven’t been to Staff Meal’s food truck yet, but when I go I hope this is on the menu so I can order it again. Staff Meal’s lap cheong arancini: Chinese sausage + fried rice balls, with duck sauce. My boyfriend ordered the Gallows’ “hot tamale” dog ($9) for his appetizer, sans the nacho cheese. This was a hot dog unlike any either of us ever had before. It was complex by design: chilies, green tomato relish, corn. I snagged a couple bites and loved it. My boyfriend was impressed but not enamored. Like I said, the flavoring was complex and layered, and complex just isn’t his thing; he prefers simple and bold. But still, he appreciated the dish and finished it. The Gallows’ “hot tamale” dog with chilies, green tomato relish, and corn. For my entree I ordered Mei Mei’s kung pao chicken dip ($15). The flavors were phenomenal, blending spicy Atlas Farm jalapeños, rich Vermont cheddar, chopped peanuts, and crostini. Each bite had a definite kick to it — the jalapeños speaking — and I loved every one. 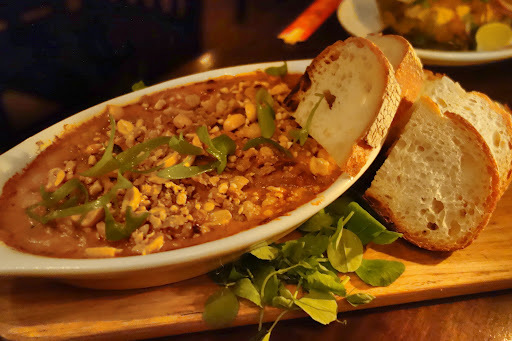 Mei Mei’s kung pao chicken dip with jalapenos, Vermont cheddar, chopped peanuts, and crostini. Update: Mei Mei posted an approximation of their recipe for this awesome creamy-and-spicy kung pao chicken dip on their blog. Check it out! 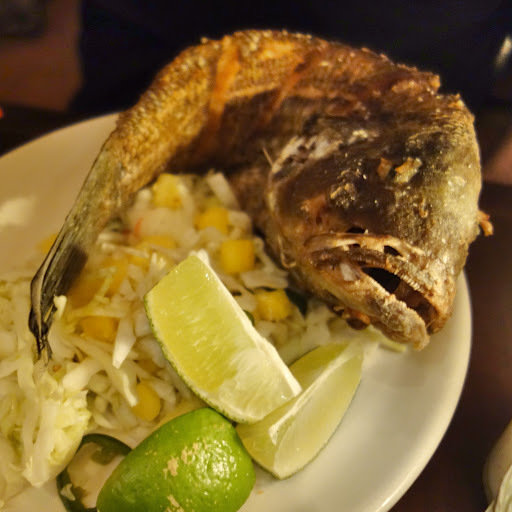 My boyfriend ordered the Gallow’s whole fried fish ($32) for his entree. It came to the table curled on a plate, a whole black bass whose giant creepy eye glared at me all throughout dinner, thoroughly angry at us for eating it. It was yummy and totally worth it. (Sorry, fishy!) You did have to be alert for loose bones, obviously. The Gallows’ whole fried black bass. The black bass was served with french fries in a paper bag. As he neared the bottom, my boyfriend stated that he had a revelation as to why these fries were good: “They are everything that people like about McDonald’s fries, except these are better.” This raised my eyebrows. We have a longstanding dispute about McDonald’s. On one hand, he has dined at more Michelin-rated restaurants outnumbering the years I have been alive. On the other hand and keeping in mind that fact, I try to overlook that he will still order McDonald’s a couple times a year. At this point I’m sure he finds my reaction amusing enough that he’d suffer through the food even if he didn’t like it. In any event, I am an unrepentant snob when it comes to fast food. I have been told on occasion that McDonald’s fries are good, but I will never eat them and it certainly doesn’t occur to me that using the word “McDonald’s” to describe the Gallows’ fries is especially complimentary. But he assured me it was. “They are perfectly crispy on the outside and yet fluffy on the inside,” he explained, “and they have just the right amount of salt. They are thicker than McDonald’s fries, which is also good, and they are cooked in much cleaner oil.” He ate all of them. Through the weekend, he reminisced about them. The dessert course worked a little differently. The diners ordered their desserts at the table and then paid their check, and were given a ticket with the name of their chosen dessert to take outside. The diners then took each ticket to the Mei Mei food truck parked in front of the Gallows to receive their desserts. This suited me just fine — another opportunity to talk to the awesome Mei Mei owners! Once at the truck I got my order of Mei Mei’s fried steamed buns ($4). They came dusted with powdered sugar and lined with chipotle nutella. (Did you know that chipotle nutella existed? I didn’t.) The sweet-and-savory-and-spicy flavor mix was definitely a different kind of dessert than I’m used to, but I loved it. Mei Mei’s fried steamed bun with chipotle nutella. Mei Mei offered us a couple extra desserts. At upscale restaurants you will often get a complimentary dessert or two, sometimes candies or something small and baked, but this felt different. This wasn’t so much “Here’s some free food,” but rather a gesture by people who genuinely love cooking food for people who love eating food. You know how your friend who’s really into music will turn on a song to share with you because he thinks you’ll like it? That’s what this was. 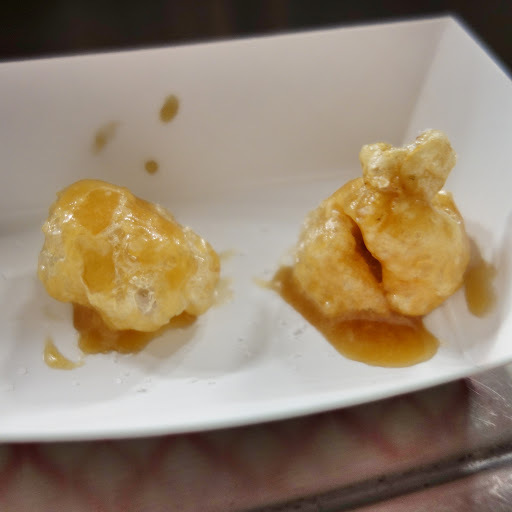 The first dessert extra was a maple pork rind. This was my first ever pork rind so I didn’t really know what to expect. I now think that pork rinds would be the greatest movie theater snack ever and that I should (1) figure out how to make them and (2) figure out how to smuggle them into a movie theatre with me sometime. Mei Mei’s maple pork rinds. 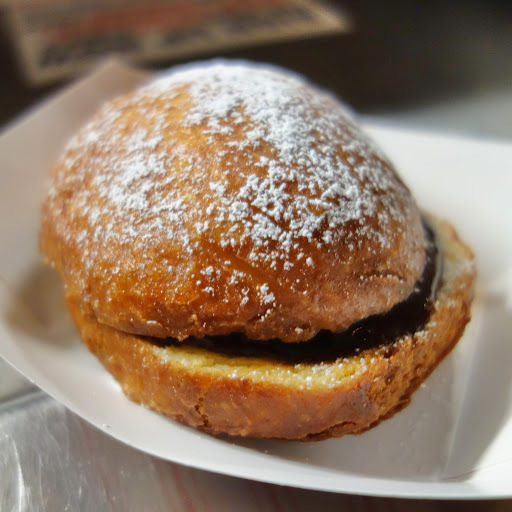 The second dessert extra was a nutella macaroon. First off, I am a macaroon fan. 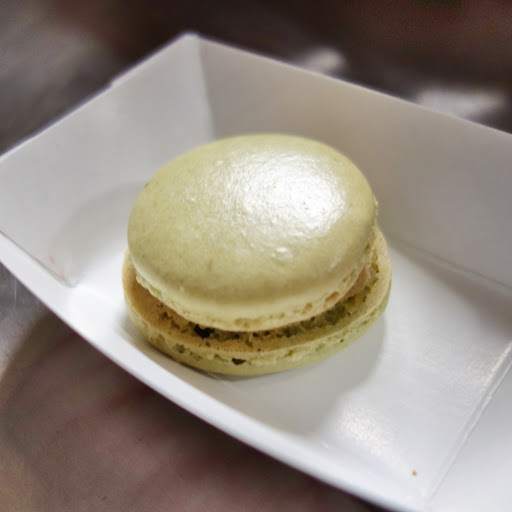 I have eaten macaroons at top-of-the-ladder restaurants including L’Espalier, Menton, Daniel, and Per Se, so you can believe me when I say that Mei Mei’s nutella macaroon has got some game! This is a perfect example of how fun and memorable it can be to see chefs make food outside of the cuisine they are known for. On the walk back to my dorm I was already hoping that the Gallows, Staff Meal, and Mei Mei do another one of these dinners. It was wonderful to experience this collaboration between a brick-and-mortar restaurant and two food trucks, from both a diner and food blogger standpoint. I had never before eaten food from any of the involved eateries, but you can be sure that I will be returning to all three! Moreover, in an environment where restaurants and food trucks are default enemies, these three created the ultimate team-up. I don’t know if they were consciously rejecting the negativity or just focused on contributing something positive, but it worked brilliantly. And it tasted incredible. Unfortunately, Staff Meal ended up closing. Mei Mei opened a brick-and-mortar location at 506 Park Drive in Boston. I love Mei Mei! Looks like you guys had a fantastic dinner. Especially because you ended the meal with that Nutella macaroon!